How I Gave Up Sugar: You Can Too With These Tips! I am a sugar addict. I am sure my daughters are too. We used to bake fabulous decadent desserts before we even thought about what we would cook for dinner. At least five times a week. Mostly chocolate. Had to have chocolate. And those nights we didn’t bake some delicacy, we ate chocolate chips straight out of the bag. Yes. Pretty bad. Last May 2017, both of my daughters were away on their vacations and I worked up the courage to attempt to give up sugar and all highly processed foods overloaded with sugar. I was never successful in the past. I always blamed my daughters. Of course, I “had” to bake for them, and of course, the pantry was full of sugary processed foods because of “them!” That’s what I always told myself. But they weren’t around that fateful day last May, so the responsibility for the decision fell squarely on me. I read about all the dangers of consuming too much sugar: it put my body in a constant state of inflammation, and leached calcium from my bones. My Dexa scans from the past few years already had documented osteopenia and osteoporosis in my hips and lumbar spine. I knew I wanted to quit sugar and processed foods, and I certainly knew WHY, but sugar just tasted so good, so sweet and my body was so addicted. In the past, I told myself I couldn’t to it. However, my father always taught me, “Anything you can do, I can do. And I can do it better.” Lots of people do not eat sugar. If they could do it, so could I! So on that fateful day last May 2017, I gave myself permission to give up sugar and processed foods that were nothing more than empty calories. At least I was going to give it a 100% try. Another cliche my father always used was, “Mind over matter,” and this was no different. No more blaming my daughters because I was “forced” to make chocolate desserts for them. No more “listening” to my body begging me for sugar or crappy snacks. This was mind over matter. Intellect over heart. No emotions. Just true grit. And so I stopped. Cold turkey. And I’ve never looked back…..
A “PR” in Alaska in August 2017. I was mighty happy. So just what happens when you eat a heavily refined carbohydrate like sugar? Your body will borrow vital nutrients from your healthy cells to metabolize it. Magnesium, potassium, sodium and especially calcium are taken from various parts of the body. Sometimes, so much calcium is used to neutralize the effects of the excess sugars that your bones become osteoporotic due to the withdrawal of calcium. Just like mine. And this same situation applies to teeth as well. Sugar makes your blood very thick and sticky, decreasing blood flow into the tiny capillaries of our teeth and gums. We all know diabetes is a too common disease that’s caused by excess sugar and excess fat in the diet. Diabetes is caused when the pancreas fails to produce enough insulin when blood sugar rises. When an excess amount of sugar is introduced into your body, it can be sent into a rapid shock from the quick spike in the blood sugar level. The pancreas cannot keep up and finally wears out from all the extra work, and that’s when diabetes rears its ugly head. On the other hand, when your pancreas overreacts, to a large amount of sugar in your body, it can release too much insulin and hypoglycemia (low blood sugar) results. I am intimately familiar with this disease because my own mother was diagnosed with adult-onset type 2 diabetes when she was 76 years young, which advanced into type 1 diabetes within a few years. And some recent studies have called Alzheimer’s disease “type 3 diabetes” because of the insulin resistance of the brain. How sugar harms the brain is not clear yet, (although scientists do know that people who have diabetes show greater risk for brain shrinkage and dementia.) It is clear that inflammation likely plays a role, and that diets high in sugar crowds out nutrients that are key to overall health. Other diseases linked to sugar that you may be aware of are obesity, heart disease, (heart disease and stroke are the number one causes of death among people who have type 2 diabetes! ), high blood pressure, gallstones, some digestive issues such as bloating, belching, food sensitivities and even depression. Why Else Should You Not Want To Consume Excess Sugar? During sugar’s refining process 64 elements are destroyed or removed. Sugar contains no nutrients, no healthy fats, or no enzymes. Sugar only contains empty calories that are quickly digested and pulls minerals from your body during the digestion process. It has been said that sugar is addictive and just as habit-forming as any narcotic. Sources of Sugar: Naturally Occurring and Added. There are two types of sugars in our diets: naturally occurring sugars and added sugars. Naturally occurring sugars are found *naturally* in foods such as fruit (fructose) and milk (lactose.) Naturally containing sugars in fruits and vegetables blunt the “sugar shock” to your bodies by their fiber, enzymes, vitamins, minerals, and water, which slows down digestion and helps your body deal with sugar more easily. This helps prevent insulin spikes. Added sugars are any sugars or sweeteners that are *added* to foods or beverages during processing or preparation. For instance, adding sugar to your cereal or coffee, or in breads, and highly processed shelf stable foods. How Much Sugar Is Enough In Your Diet? Our bodies do not need sugar to function properly. Sugar contributes additional calories and zero nutrients to food. Currently, the American Health Association (AHA) recommends that men consume no more than 9 teaspoons, or 36 grams, or 150 calories of sugar a day. 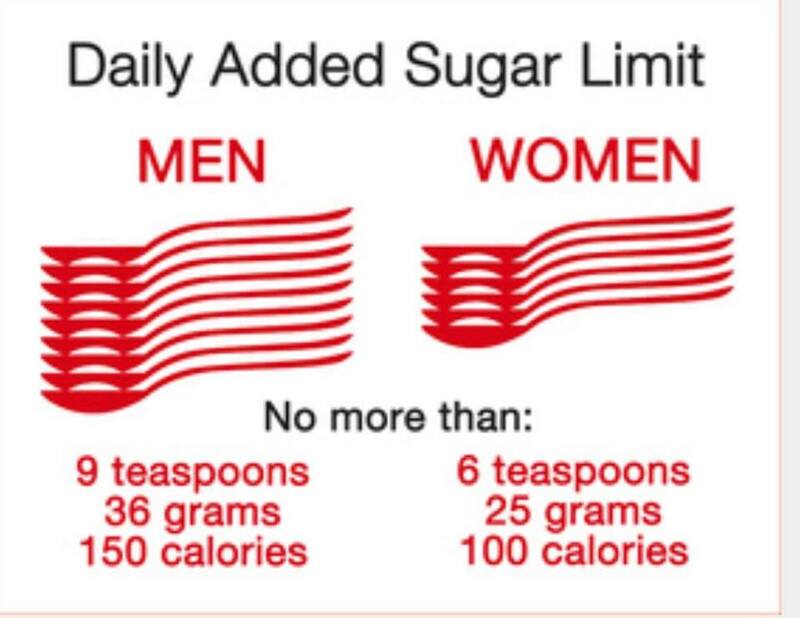 For women it is 6 teaspoons, or 25 grams, or 100 calories of sugar in a day. 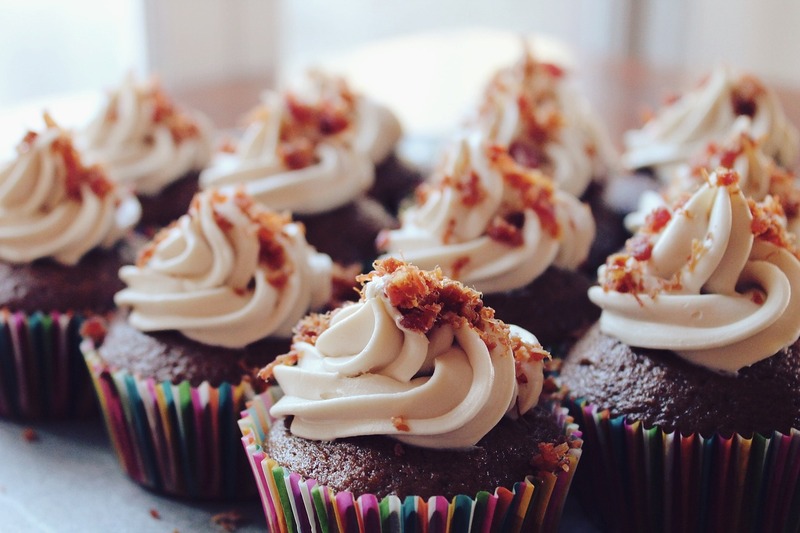 Cutting back on sweets in your diet can actually make resisting sugar easier! For me, I noticed when I stopped eating the mother lode of sugar in my diet, my cravings were reduced. Toss your sugars at home. Or put sugar in a closet or in a very high kitchen cabinet where you won’t be tempted. This includes white and brown sugars, honey, agave and maple syrup. Avoid drinks with lots of sugars: sodas and lemonades come to mind. Water is always the best. Check food labels scrupulously when you are grocery shopping. 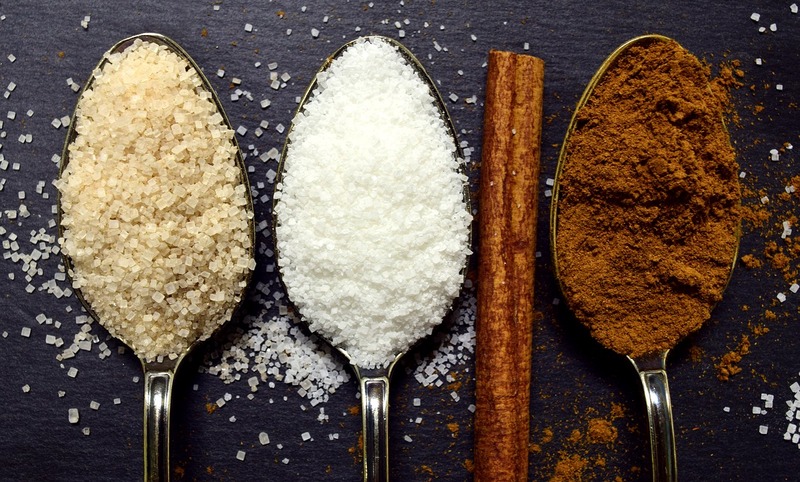 Familiarize yourself with sugar by its many names. Words that end in -ose are sugar, so is anything with syrup or sugar after its name. There are food label changes on the horizon to make it easier for consumers to make wise food choices. Manufacturers will have to list “added” sugars separately from naturally occurring sugars (as mentioned above in fruit and milk.) Updated labels are supposed to appear this year, with small businesses having an additional year to comply. Cut out sugar for a specified period of time, like one week. (I was so addicted, I began initially skipping dessert and junk food for ONE DAY.) On your sugar detox journey, you might miss added sugar for the first few days, but as your mood improves and your energy level skyrockets, you will be so glad you are on this path. Substitute. Substitute. Substitute. In place of decadent chocolate brownies, chocolate cake, and double chocolate cookies, I chose to make myself fruit sorbet. I purchased huge frozen bags of pineapple, mango, cherries, blueberries, and strawberries. I would also freeze bananas. I would get out my Cuisinart mini chop and add a handful of several kinds of the frozen fruit, and whirl away. The naturally occurring sugars kept my body sated and were a HUGE improvement over the desserts I used to make and I junk foods I used to devour. Now that I’m farther along in my sugar detox journey, I often eat an orange or an apple with peanut butter for dessert. Your journey won’t be perfect. And don’t expect it to be. You know how powerful a sweet tooth is, so don’t be surprised when you encounter a few challenging moments. If you do happen to give in to a craving, do not give up! Do not become discouraged! 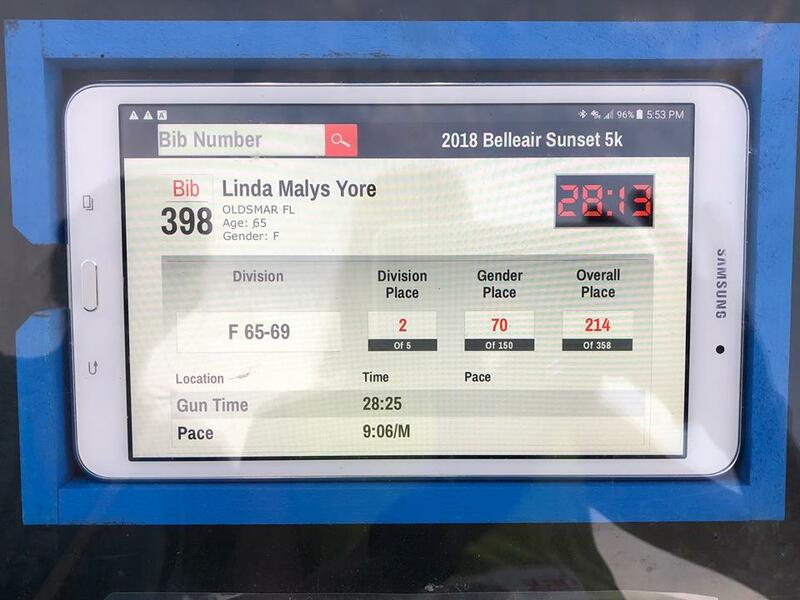 My latest 5k race results from January 2018. I have not had results like these in many years. Giving up sugar and processed junk foods really have boosted my athletic performances. 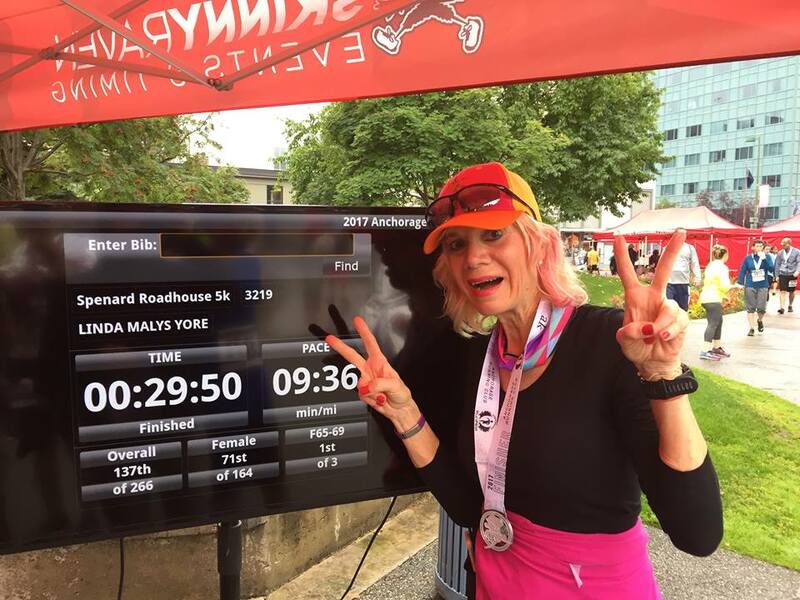 I noticed the remarkable change that was happening in my body once I gave up sugar when I ran a PR (personal record) in a 5K race only two weeks after I began my sugar detox journey. And I have gotten better in subsequent races after that, even while healing and rehabbing my broken ankle. I thought Christmas with all its indulgences would trip me up, but it did not, even though I gave myself permission to have anything I desired, within reason, of course. When I go to Walt Disney World with my daughters, especially EPCOT, I do take a taste of every delicacy they offer me. I’m not going to miss out on special moments in life or with my girls. That’s when it becomes a chore and not an adventure! You have all heard someone say, “I feel so unbelievable!” when they have made a major change in their life. I am telling you I have never felt better. I sleep better. I am training better and having unbelievable results. And my latest Dexa scan even showed improvements in my bones. I’m just sad I waited so long to give up sugar. and I don’t want you to wait any longer either. Great article and thanks for the tips. I am planning to cut out sugar 8 weeks out from my triathlon this year. That’s a great idea. Good luck with your training! Linda dahhhling, once again you never cease to amaze me!!! I learned more from your article…in lay terms… than from my Numerous health books!!! As you know, I too am type 2 and finally I have realized, if I forbid myself Sugar, I want more!! Hi Barb. Yes, I remember you are type 2 and I also remember you dealt with it scrupulously. You are correct, moderation is key in anything in life. and your nickname is so fitting because you are soooo sweet my dear! Linda – I am trying to cut out sugar-how about artificial sweetners? Mary Ann, check out stevia. I’ve used it in the past and liked it.Good luck with your sugar detox journey. You are so right. Giving up sugar is a journey with lots of ups and downs. Bit the journey is so worth the time you put in when you feel incredible. I stopped most sugar last July. I joined an online workout / lifestyle program, and was encouraged to give up sugar. It’s not all gone – but I almost never eat candy (and not at work, that was getting to be every day), So I just stopped, eating it, buying it. I do buy stuff for the kids ocassionally, but my sugar consumption is way down. And I feel better and don’t crave it! Which is a big shocker for me – I used to eat ice cream daily. Thanks for your informative article. Well, good for you Michelle. That’s wonderful. Bravo!!! When Breyers came out with its vegan ice cream, it was/is the BEST I have EVER had. Walmart is one mile from my home. Soon as Victoria and I finished one container, I would be at Walmart purchasing another. What a bad habit. Ugh. Like you, I’m very surprised I do not crave sweets anymore either. Excellent article and information. 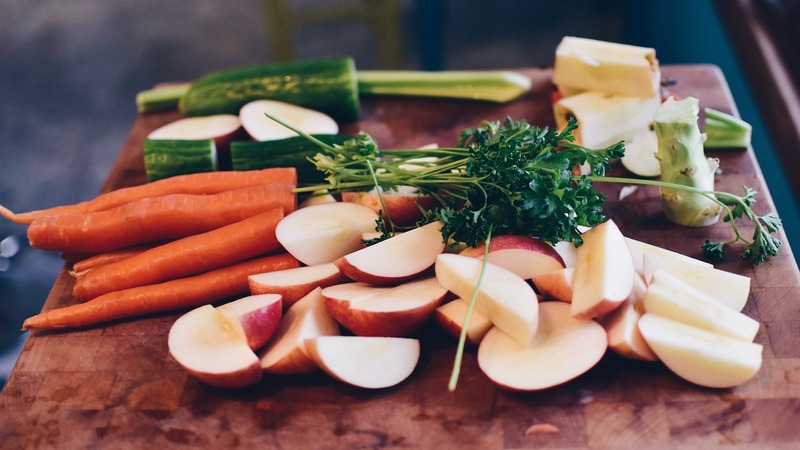 Once the sugar is out of your system, fruits and veggies are ever so much more enjoyable. It can be done. Christine, aren’t we proof of that!? Congrats Ruth for deciding to give up sugar. If I can do it, so can you!! !